Hi everyone, Just popped in to say hi and wish everyone a happy new year good to see the site still going . 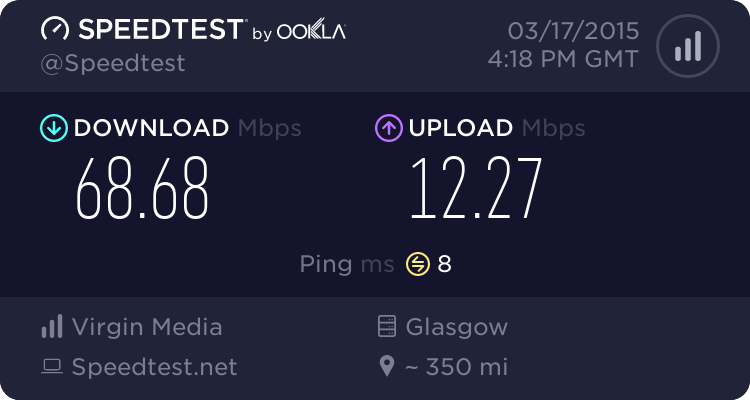 Was with smallworld but they have been taken over by Virgin Media and as you can see my speed of my net is faster and it is fibre optic and this is with wifi and when i use my pc with Ethernet Cable it's a lot faster up to 150 Mbps download speed. Topic: Sign this petition to save Firth of Clyde fish stocks!!! Re: Sign this petition to save Firth of Clyde fish stocks!! !